The initial crack is defined by replacing one or more elements by "crack-blocks" to build up one or more crack fronts in the model. Each crack-block models a section of crack front and the combination of multiple crack-blocks allows modelling of a complete crack. The replaced elements are identified by their element numbers and the orientation of the crack front section in each is defined by two node positions on each replaced element. The first two methods are appropriate for simple meshes in which the elements are fairly regular. 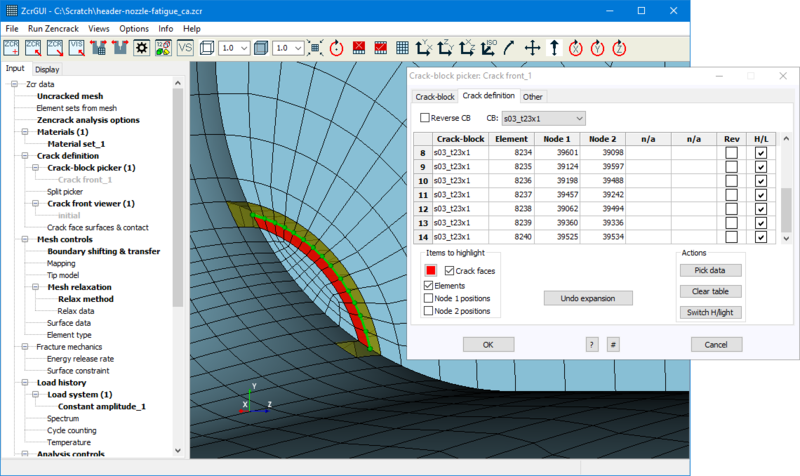 The user only has control over key points along the crack front section with intermediate points determined by the element shape functions. The spline method is extremely powerful and gives total control over the entire crack front shape. Crack front nodes are placed onto the spline and the crack-blocks are mapped into the element space taking account of the crack definition. This input specifies that element 826 is replaced by crack-block s01_q103x4 with crack orientation using nodes 1203 and 1204. Element 824 is replaced by crack-block s01_t88x5 with crack orientation via nodes 1203 and 1255. The initial crack shape is cross-referenced to a spline named STARTER. This screenshot shows an example of the process for defining an initial crack front in the Zencrack GUI. This is the simplest way to define the crack front as it allows creation of the keyword input data without the need to manually extract element and node numbers for the crack-blocks. Instead, the target elements and nodes are picked from the uncracked mesh. For deep initial defects the Zencrack deep crack option can be used to separate pairs of standard elements that are on the crack faces. To use this option the user replaces some elements by crack-blocks and also defines element split pairs. Each element split pair contains two elements that straddle the crack face. Zencrack separates these elements. Example of a deep crack. This example also uses boundary shifting (see below). The initial cracked mesh can be analysed as a one-off crack size or as the first step in a crack growth analysis.